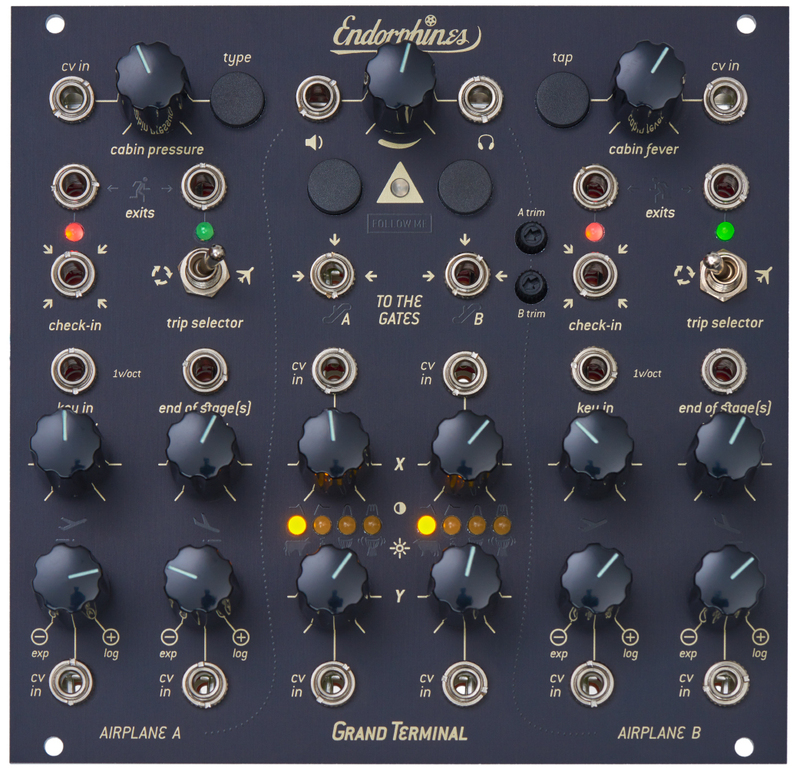 The Grand Terminal is a digital multipurpose module. Its two function generators can be used as envelopes, LFOs or VCOs. 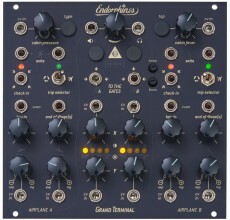 The 2 filter channels individually offer 8 modes of operation, and combined with its mixing and routing capabilities and a multi effects unit, it is not only a complete back end of a synth voice, but can also be used as a synthesizer voice, stereo filter bank or general purpose sound effects processor. 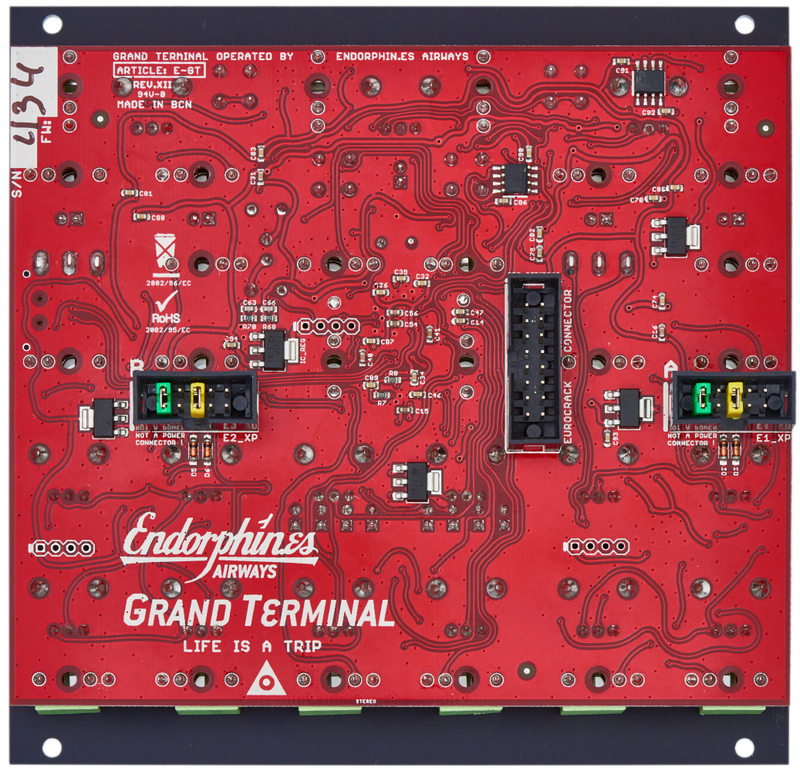 The Grand Terminal is based on an ARM M4 DSP, audio resolution 48 kHz/16Bit. Its two filter channels can be used in parallel or serial, and there is a link mode for stereo operation. 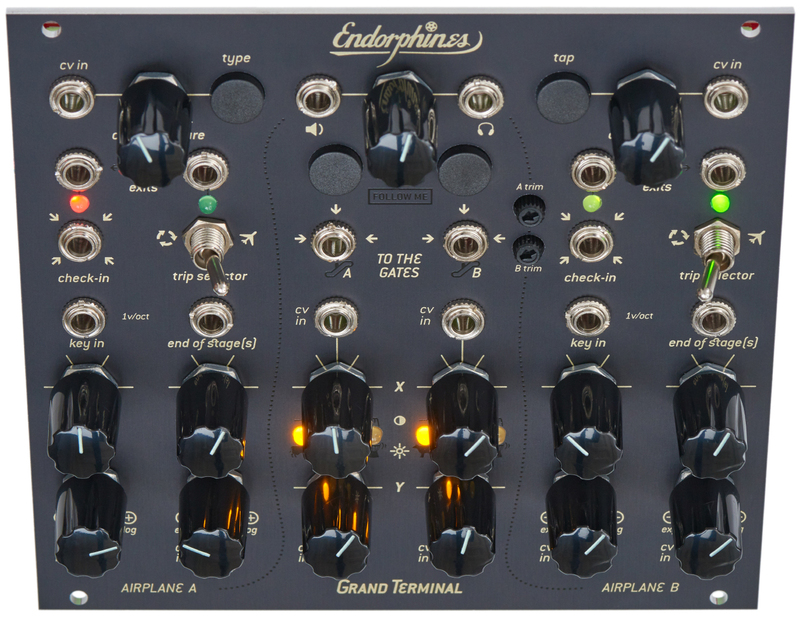 The Audio inputs have individual trimmable gain stages to integrate the Grand Terminal into different production environments. There´s a soft clipping feature in order to prevent unwanted distortion. Gate A is normalized to Gate B for easy parallel processing. Each of the filters can be set to any of 8 filter types, which are: Transistor Ladder Filter (Low Pass), Diode Ladder Filter (Low Pass), Vactrol Low-Pass Gate, Resonant Vactrol Low-Pass Gate, State Variable Low-Pass Filter, State Variable High-Pass Filter, State Variable Band-Pass Filter, Comb Filter. The filter can be controlled in 2 parameters manually as well as via CV. The outputs of this section can also be controlled in Volume and Pan position. 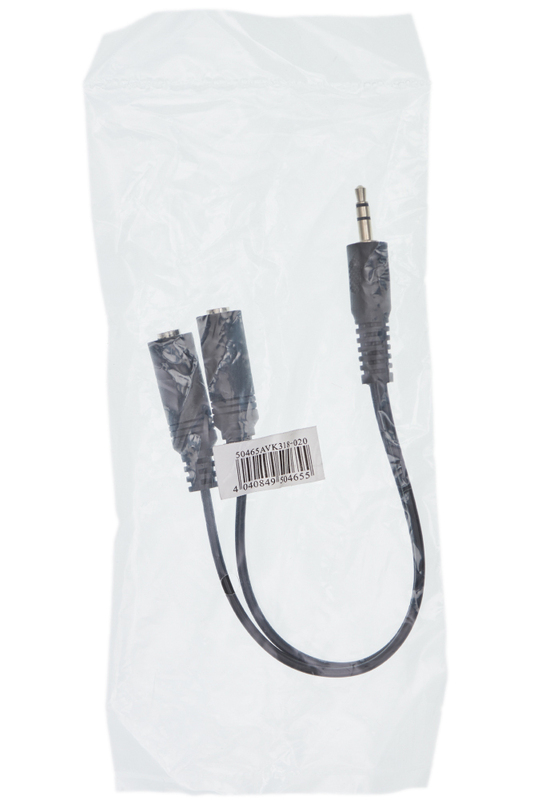 At this stage, the unit is designed to distort in the upper third of the gain control setting. The built-in multi effects processor features eight algorithms which can be altered in 2 crucial parameters and a possibility to crossfade between the dry and the effected signal. Its algorithms are: Hall Reverb, Shimmer Reverb, Room Reverb, Spring Reverb, Ping-Pong Delay, Tape Delay and Chorus. At the end of the audio path, there´s a Master Volume Control as well as one Mono and one Stereo output. The two function generators can operate as AD or AR envelopes. All time parameters can be set between 1 ms and 10 seconds, manually as well as via CV. The envelopes can be individually set to loop and then act as LFOs or VCOs (following V/Oct for about 6,5 octaves). They also feature End-of-Stage Outputs. When used in connection to the Gateway, all controls which are normally set by jumpers on the back of the module are accessible from the Gateway´s front panel.